I Spy Animals: Aren't They All Alike? Cute as babies, certainly, but they all looked greenish-gray as adults. 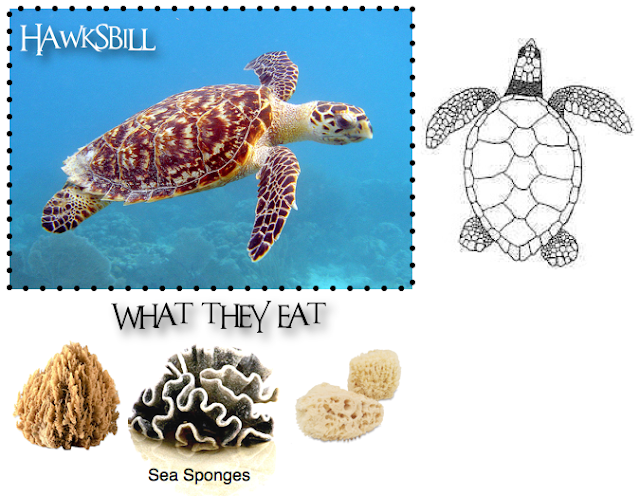 Did you know that not all sea turtles are alike? Think of it like this: We know there seven types of zebra, and they all eat grass and leaves. And the 33 types of dolphins all eat the same thing...fish. 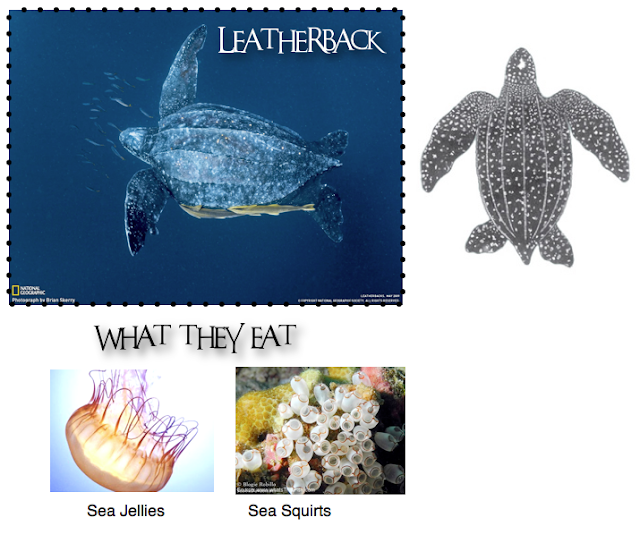 But that's not true of sea turtles. 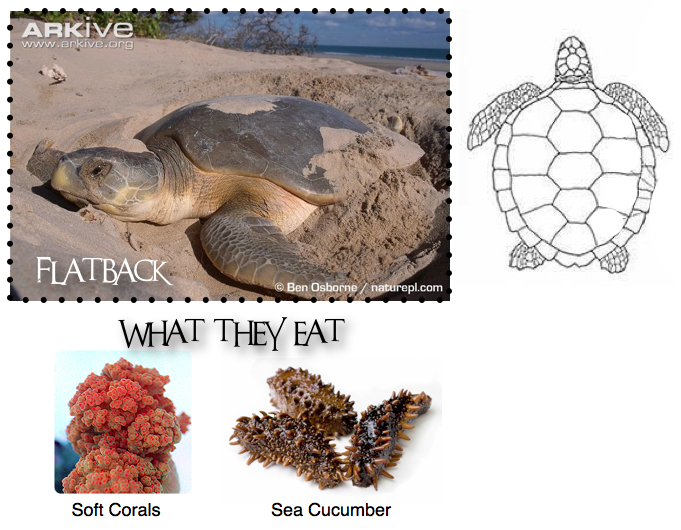 Sea turtles are picky about what exactly they eat. Each type eats completely different things than the other types. Let's take a look. The Hawksbill turtle eats sea sponges, but it's immune to the poison they can contain. Leatherback turtles are gelatinivores, eating gelatinous (squishy) things; they have sharp cusps on their upper and lower jaws that help them pierce those slippery jellyfish and sea squirts. This guy has a big problem nowadays; a plastic bag floating by can look just like a sea jelly...but it's bad news if he swallows it. 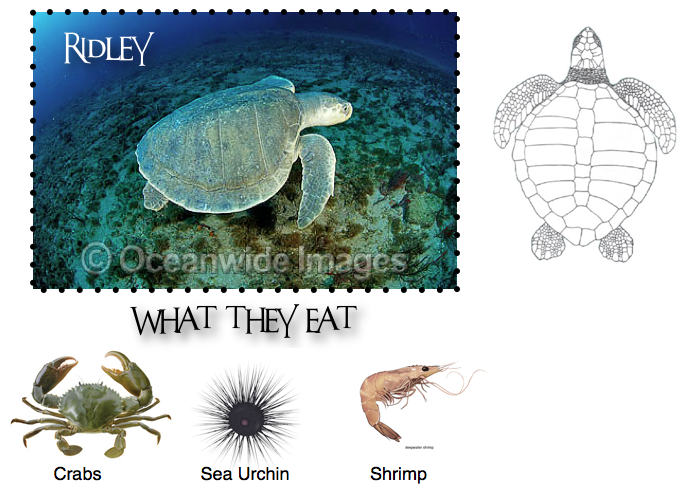 Kemp's Ridley is a carnivore, eating fish and shellfish. The Olive Ridley is an omnivore, eating shellfish along with algae. 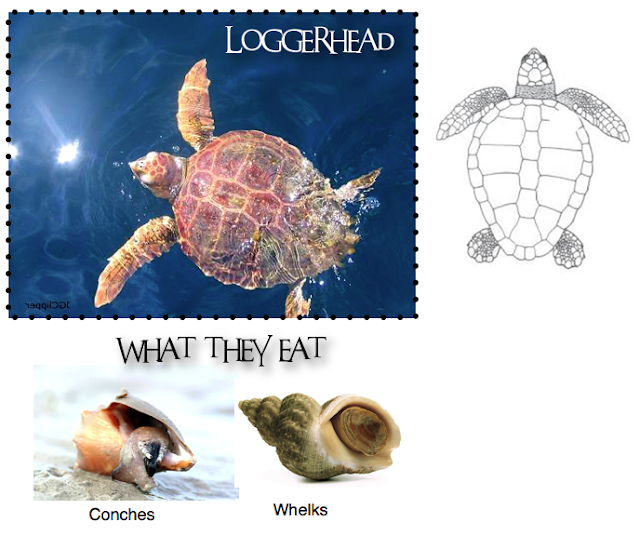 Loggerheads eat shelled creatures, which is why they have a massive head and strong jaws. They crush the shells! 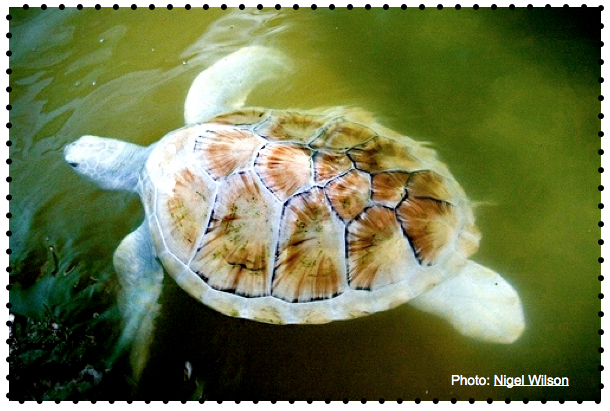 The Green turtle is an herbivore, having a serrated (saw-like) beak that allows it to scrape algae and cut tough seaweed. But why is the Green turtle called "green" when it isn't? Answer: It has a layer of green fat under its shell. Flatback turtles? Well, they'll eat whatever anyone else is eating. 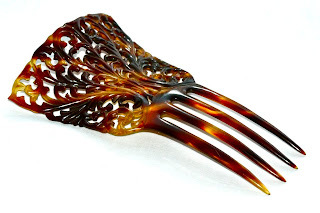 Jellies, fish, seaweed, mollusks, crabs, corals? Sure. They like everything! 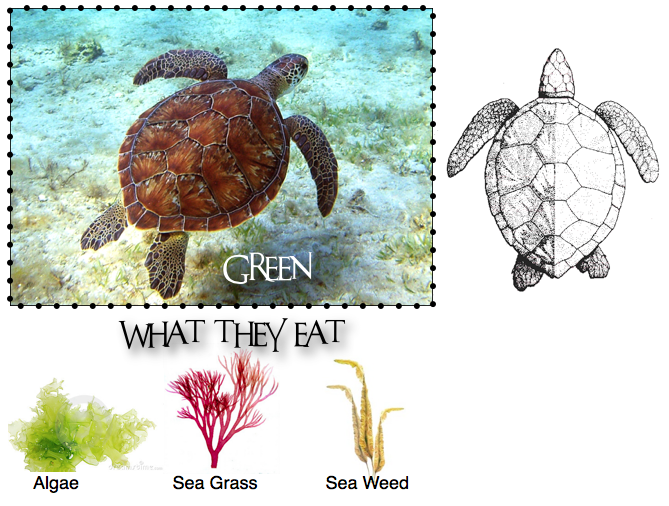 You're probably wondering what creature preys on sea turtles. 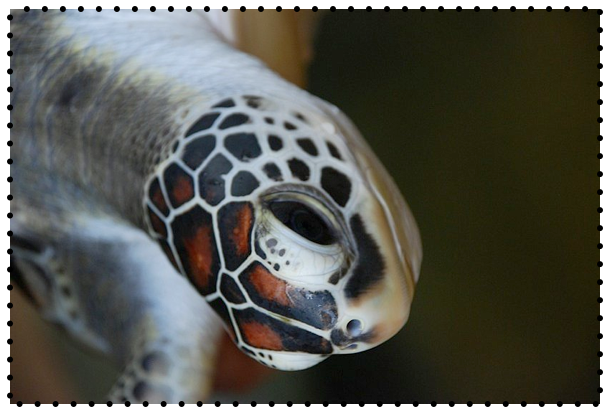 Humans prize sea turtles for their tortoiseshell, which comes from the Hawksbill turtle, and meat...ever hear of turtle soup? But sharks will also take a swipe at sea turtles. 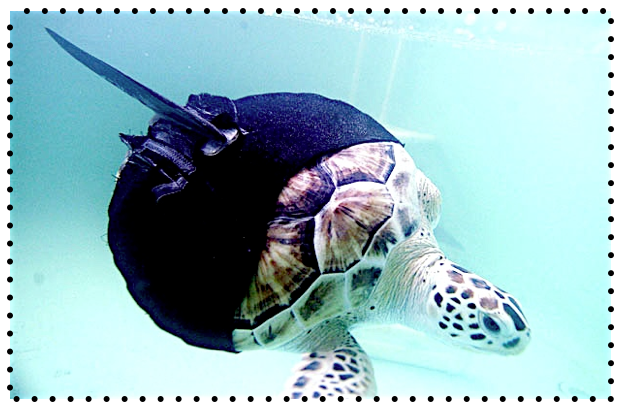 Check out the turtle below, who lost three flippers to a shark. To keep her from swimming in circles with her remaining fin, she was fitted with a steering fin. Pretty cool. So now she looks like a sting ray...or maybe a horseshoe crab? ...what species of turtle is the white turtle at the top of this post?